All reservations canceled prior to 3 days BEFORE ARRIVAL will incur no fees or charges, except for non-refundable deals. Any reservations made from a 3rd party website that needs to be modified or canceled, the guest MUST contact that booking agent directly. Non Refundable deals can be canceled but the guest will still be charged the full amount of stay. The resort is not responsible for reservations that are not canceled by the guest, thus resulting in being charged for the full stay. This would then be marked as a NO-SHOW and is not refundable. Once payment is made for the reservation, the reservation is final. Any incidentals charged as part of your reservation are non-refundable.If payment for reservation is declined during processing (3 days prior to arrival) it may be canceled and voided for non-payment. Registered Guest must be at least 21 years of age and be present at the time of check-in and must present a valid credit card and ID for imprint (Reservation name, ID, and card must all match). Non-Owners are not allowed to re-renting, leasing, subletting or transferring of this unit to someone else. Guest will be entitled to use all the resort’s amenities the same as if the Owner were using the unit (unless otherwise specified) and is expected to abide by all the Resort’s Policies while during their stay. Keysets, parking tags, along with general property information are to be picked up at our front office, which is located at 4000 Ave U, Galveston, TX 77550. Maximum occupancy for each condo is no more than 6 persons (additional fees may apply). All rental reservations are an attempt to offer/educate guests about our Vacation Ownership /Timeshare Property to sale the accommodation space value and location to potential future owners. Check-in time is as follows; Sat-Thurs 4:00 pm to 5:00 pm, and Fridays 4:00 pm to 7:00 pm (Special Event Weekends, and Peak Season hours will be different, call us to confirm). Check-out time is on or before 11:00 am on your scheduled departure day. 1.) Check in at 3 pm will incur an early check-in fee of $20.00. 2.) Check-in before 12 pm and 3 pm will incur a fee of $50.00. An Express Check-in can be scheduled for your convenience. Please notify the office in advance before our office closes for that day to schedule an Express Check-in at. Late checkouts will be available upon request for an additional fee of $20.00 per hour. Any late checkout request after 1 pm is solely subject to availability. As is customary in the lodging/hospitality industry, the Guest will need to provide a credit/debit card upon check-in as damage/incidental for a $200 deposit (this is additional to the rental rate) along with a valid photo ID. The Guest is responsible for any issues in this area (other than normal wear and tear) to the unit or its contents that may arise during their stay, payable directly to the Resort if subsequently billed for damages or missing inventory from the unit. These things are rarely a problem, but the Guest needs to be aware that timeshare vacation condo Owners and their Renters/Guests are directly responsible for damages to a unit or missing condo inventory of supplies, furnishings, towels, etc. IS SMOKING PERMITTED IN THE CONDO? All our condos are non-smoking. Therefore, smoking is NOT permitted anywhere in any of the buildings, pool area, or on the property for the health and safety of all other guests. Failure to comply would result in additional fees of $515.00 and result in forfeiture of your reservation. Smoking is ONLY permitted on the balcony of the condos, with the condo doors remained closed. Proper disposal of smoking debris is required. Unfortunately, pets are NOT permitted on the property for the health and safety of all other guests. Failure to comply would result in additional fees of $515.00 for ANY animal on the premises during your stay. The resort allows up to 2 Parking Tags issued per condo at check-in at no cost. Any additional vehicles will be the owner's expense to park elsewhere as we can only accommodate two parking spaces max. Ave U is strictly a no parking zone and will be subject to towing. PLEASE NOTE: TOWING IS STRICTLY ENFORCED 24 HOURS A DAY. Payment Policy Rental reservations payment is processed three days before the arrival date to secure and confirm the reservation. A reservation made less than the three days of arrival or same day of arrival will have the full payment processed immediately. Therefore, making the reservation final, and non-refundable under these terms. Once payment is confirmed, you are set for arrival. We accept credit/debit cards ONLY for payments of reservations. We gladly accept cards VISA, MASTERCARD, DISCOVER, and AMERICAN EXPRESS. A very spacious townhome style floor plan that features spectacular ocean views from the comfort of a 1600 sq. ft. condo. We have full-size kitchen appliances to accommodate those who want to stay in and cook. This also includes dishes, silverware, and cookware needed during a stay with us. 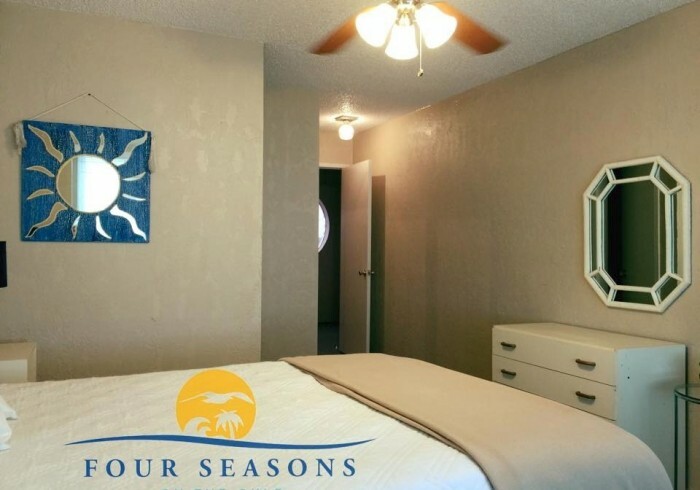 Provided towel sets, along with 2 bedrooms with queen size beds, 2 private bathrooms per bedroom, 1/2 bath, and central A/C with its own controls per unit. Private viewing deck and balcony to enjoy the views of the beach. Great for entertaining and each villa can sleep up to 6 people. We are a true value for friends and families who want extra space to comfortably enjoy your stay and in close distance to an array of restaurants, shopping, and things to do. One of the best features our guests love is that the beach is right across the street and we always have a nice gulf breeze.